While doing press rounds for "Greenberg" Stiller revealed some exciting news for the planned sequel. He told MTV, "We have a new story idea that we feel excited about and we're going to try to go forward." Stiller elaborated further explaining their idea. He said, "The beginning of the movie is [set]... 10 years later, and Derek & Hansel are literally forgotten. Nobody even knows who they are, so they have to re-invent themselves." First thing we can calculate from Stiller's comments is Owen Wilson will indeed return. The last time I spoke with you about "Zoolander 2" there was no confirmation of Wilson returning. Having the premise centered around both Zoolander and Hansel is enough confirmation for me. I couldn't imagine Stiller trying to re-cast the role. Stiller's comments also give some creditability to earlier reports that Justin Theroux would attend Paris fashion week for research on the script. 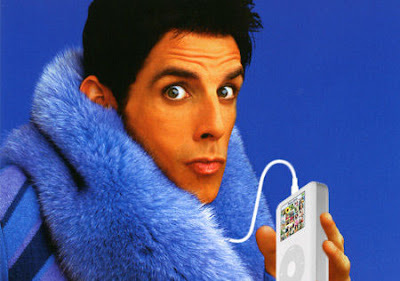 If Zoolander and Hansel do in fact need to re-invent themselves, the latest fashion will be the only way to do that. Stiller also revealed that the door is open for Will Ferrell to return as Mugatu if he is willing. He told MTV, "If Will says yes, he definitely has to be a part of it." Stiller added to his hope of Ferrell returning by saying, "To me, Mugatu is one of the classic screen villains of all time." While I wouldn't go as far as Stiller on Mugatu, I certainly wouldn't want a sequel if he wasn't involved in some form. Running on my notion of Mugatu returning in some form, Steve Weintraub of Collider also asked Stiller if Ferrell's could return. Stiller jokingly said, "Maybe 'Silence of the Lambs' style." All joking aside, Stiller made it clear he wants Will Ferrell to return in some form.